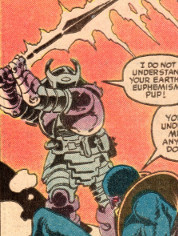 Powers/Abilities: Varga had no superhuman abilities. He was experienced in commanding military-like operations, both participating in and directing hand-to-hand combat and aircraft assaults. 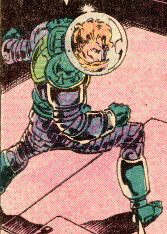 For combat, Varga typically wore a suit of armor that protected him from injury and may have granted him some degree of superhuman strength. He also carried and used a spear apparently powered with some sort of energy. Varga formerly commanded a number of Survivalists. He flew a number of ships, including a private shuttle. Varga lived by a certain code of honor, but he was also fanatically dedicated to saving his world to the point of listening to reason. He was certainly willing to sacrifice at least an alien, and he could rationalize lying about even murder, but he could not condone permitting a murder to happen if he could prevent it. Weight: Unrevealed; approximately 180 lbs. (Jack of Hearts#2 (fb)) <Decades ago> - Varga was present the day the Mother Superior of the Sun Priestesses announced to the populace that their sun was dying, and their world would soon follow. (Jack of Hearts#2 (fb)) - As the sun cooled, Contraxia's outermost colonies were abandoned. (Jack of Hearts#2 (fb) - BTS / Jack of Hearts#3 (fb) - BTS) - As their sun cooled, the Contraxians' outermost colonies were abandoned; their innermost worlds became overpopulated by the refugee races from the frozen outer worlds; Contraxia became a world of constant winter; and there were shortages of food and shelter. (Jack of Hearts#2 (fb)) - Eventually, feeling that their rulers did nothing as their world died, Commander Varga questioned whether they must accept their own demise. Traveling to the Temple of the Sun, Varga insisted he address the Priestesses with a plan to save their people; representatives from every world in Contraxia's system assembled to hear Varga speak. After denouncing the Priestesses of the Sun's failure, Varge proposed they send out an expedition to seek out and find habitable worlds capable of harboring them. Mother Superior revealed that they had already considered this, but the worlds they found capable of supporting life were already inhabited. She reminded the people of their code of honor, which forbade them committing genocide even to save themselves. When the people present voiced that survival by such means would cost them their souls, Varga bowed before the will of their people, and Mother Superior acknowledged him as a good man, asking him to find a moral means of survival. (Jack of Hearts#1 (fb) - BTS) - Years later, after Contraxian emissary to Earth Marya's actions had led to the empowerment of the her human-hybrid son, Jack of Hearts, Varga apparently took a Mothership and a group of Survivalists to Earth's orbit. Varga sent one of his Survivalists (Oltnam) to Earth to spy on Jack as "Freeman Smythe." (Jack of Hearts#1 (fb) - BTS) - Jack of Hearts attempted suicide as his powers were out of control and seemed to be killing him. (Jack of Hearts#2 (fb) - BTS) - Varga decided to capture Jack, force him to use his powers to their maximum to save Contraxia's sun, and to take credit for saving his people. (Jack of Hearts#1) - Contraxian Survivalist saucers attacked the Hart estate, and "Marcy Kane" -- acutally the Contraxian Kaina had been sent to monitor the Hart family and their research years before, but had fallen in love with Jack -- shut down the neutro-mist generator that neutralized Jack's power so he could save himself. Jack drove off the attacking fleet and then flew off with Marcy. (Jack of Hearts#2) - Marcy revealed to Jack the Contaxians' history and plight, as well as her Contraxian nature and his hybrid nature. (Jack of Hearts#2 (fb) - BTS) - Having gathered cannisters of neutro-mist, which neutralized Jack's power, Oltnam linked up with Varga. (Jack of Hearts#2) - As he was overcome with emotion, Jack's powers surged and were detected by both SHIELD and the Contraxian ships under Varga's command, both of whom went after him. After Jack fought off the Contraxian ground troops, Varga sent saucers after Jack, and they engaged him in the town of Portsmouth. Kaina prepared to try to reason with Varga and tell him that Jack would willingly help them (although Varga's attacks made him question this), but Varga had Kaina transported aboard his ship, after which an armored warrior restrained Jack. 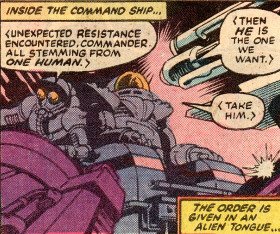 SHIELD commander Nick Fury's troops then arrived and blasted the warrior holding Jack, freeing him, and he incapacitated the entire fleet. Varga's ship fled back to the Mothership, and Jack followed, seeking vengeance, but Kaina convinced him to come aboard peacefully to save her people. (Jack of Hearts#3) - As the Survivalists, Kaina, and Jack arrived on Contraxia, Varga told them how he had captured the "human" so he could be forced to save Contraxia, but Kaina revealed the truth, and Jack confirmed his willingness to help. The Priestesses noted that they could use their advanced sciences in an effort to determine the means by which they might channel Jack's power to rekindle their sun, and they arranged a vote in which the people voted to live with honor or not at all. The Survivalists, however, plotted to prepare stronger measures to ensure their world would live, with Varga prepared to consider a choice between morality and necessity. Later, distantly and secretly viewing as the Sun Priestesses revealed that it would almost certainly cost Jack his life if he tried to save their sun, the Survivalists terminated the contact and resolved that they could not risk leaving the decision to a "human" who had no reason to sacrifice his life, and they resolved to capture Jack and force his compliance; by prematurely terminating the contact, they did not hear that Jack had agreed to risk his life to try to save them. As Jack and Kaina attempted to enjoy a romantic night together, Survivalists scanned the building and attacked the pair after determining that Jack being out of armor meant he had temporarily neutralized his power by other means. As the neutro-mist's effect faded, Jack sent Kaina away, and he lashed out at the Survivalist attackers, but Kaina ran into Vargas and Oltnam, who refused to believe that Jack had offered to risk himself to save their world. When Jack's powers surged forth, Varga was shocked by the magnitude of the ensuing explosion, and he was equally surprised to see Jack had survived. 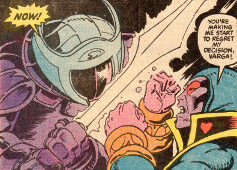 Unwilling to listen to further discussion, Varga donned his helmet and attacked Jack, who held back somewhat, still trying to explain his willingness. Meanwhile, Oltnam knocked out Marcy and then used SHIELD neutro-mist to de-power Jack and knock him out, too. Oltnam then slew the Sun Priestesses as well. Varga was appalled, but Oltnam argued that the people might have supported the Sun Priestesses' pacivity into death; he continued that they could tell the population Jack had refused to save Contraxia and had slain the Sun Priestesses himself. With the end goal of saving Contraxia, Varga agonizingly agreed to this option. When Oltnam related his version of events to the public, they agreed that the murderer Jack should be sacrificed to save them. Jack was rendered insensate and placed aboard a solar probe ship, shackled so that his power would be channeled into its systems and automatically unleashed once he entered their sun's orbit. (Jack of Hearts#4 (fb) - BTS) - To prevent Kaina from exposing the truth, Oltnam secretly had her placed aboard the solar probe ship as well. (Jack of Hearts#3) - As the ship took off, Varga privately vowed that he would commit suicide for his dishonor once Jack had saved the sun. (Jack of Hearts#4) - As Varga suffered pangs of guilt, he and Oltnam had a brief argument about their previous code of honor. Varga voiced that his conscience would only be appeased when Kaina revealed that it was the Survivalists who slew the Priestesses of the Sun; however, Oltnam advised that Varga might be suffering the pangs of conscience for quite some time, and he revealed that Kaina was also aboard the ship bound for the sun. (Jack of Hearts#4 (fb) - BTS) - Though having rationalized the sacrifice of the half-breed Jack of Hearts, Varga was unable to condone the murder of Kaina, a Contraxian born. Accompanied by Oltnam, Varga led a fleet of Contraxians ships through hyperspace in pursuit of the solar probe ship, intending to rescue Kaina. (Jack of Hearts#4) - As Varga's fleet emerged from hyperspace, Oltnam warned that Varga's honor would see them all dead; and when Varga turned his back, Oltnam pulled his sword. Varga boarded a solo shuttle, planning to save both Kaina and Jack; but Oltnam ambushed him, striking him down from behind with his sword and then jettisoning the shuttle so Varga might die along those he sought to save. Varga soon docked with the solar probe ship, announced his intent to make amends, helped Kaina aboard his shuttle, and freed Jack from his shackles. Jack, however, sealed the shuttle and sent Kaina away to safety, leaving himself and the mortally wounded Varga aboard the solar probe ship. Jack told Varga that his sacrifice helped convince him Contraxia was worth saving, and soon after Varga succumbed to the sun's heat. (Jack of Hearts#4 (fb) - BTS) - Jack survived the rekindling of Elidra. Comments: Created by Bill Mantlo and George Freeman. When observing Jack's power's surging, Varga exclaimed, "Gods--!" You might take that to mean he and at least some other Contraxians worshipped multiple deities, beyond solely the sun. Anything else, is purely speculative. Varga also invoked the Heavenly Hosts. 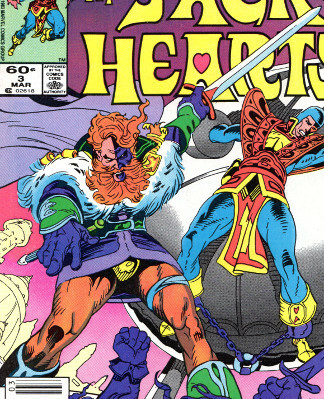 (Jack of Hearts#4) - As Varga's fleet emerged from hyperspace, Smythe warned that Varga's honor would see them all dead; and when Varga turned his back, Smythe pulled his sword. Varga boarded a solo shuttle, planning to save both Kaina and Jack; but Smythe ambushed him, striking him down from behind with his sword and then jettisoning the shuttle so Varga might die along those he sought to save.